Amazing, my hair feels so soft and silky. I drove home with my car roof down normally I’d have a tangled mess to deal with but a quick comb sorted it. Tied it up for a hot steamy shower and again a quick comb sorted it afterwards. My hair keeps its style does not flick out through the day and needs very little attention from my GHD’s after drying. Wish I’d had it done sooner, it’s a joy to be able to have my hair down and know it will look as good at the end of the day as it does at the beginning. The gorgeous model Rudie shows the amazing strength and results of the Kerastraight treatments service. 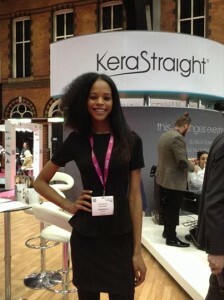 Please note: Kerastraight is designed for use with European hair as well as Afro Caribbean hair. What make KeraStraight KS Ultimate Treatment the first choice over alternative products? Our product is designed by hairdressers who understand the needs of both salons and the clients. It also has the endorsement of some of the greatest award winning hairdressers who value the KS Ultimate Treatment as not only providing the ultimate results but also in the fact that KeraStraight is completely and certifiably safe for the user and consumer. If I am pregnant or breast feeding can I safely have a KeraStraight Treatment? YES, KeraStraight KS Ultimate Treatment is completely safe to use during pregnancy and while breast feeding. 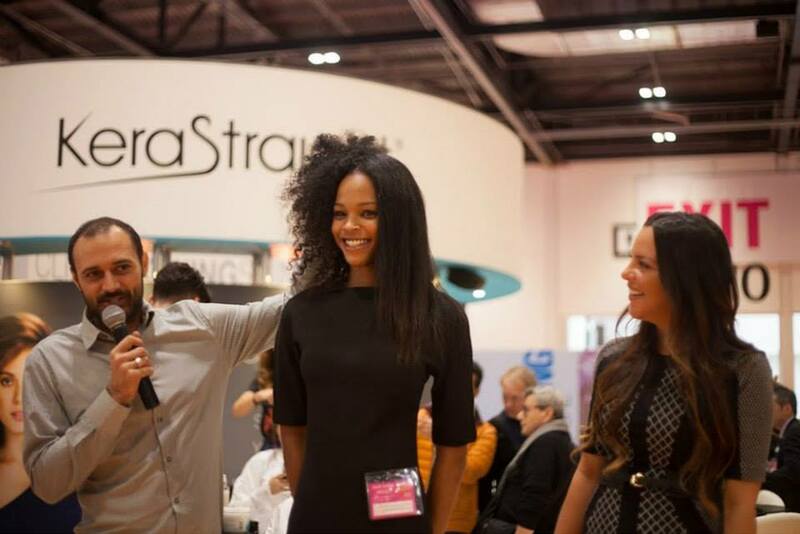 Is KeraStraight KS Ultimate Treatment a permanent straightener? No, as KeraStraight KS Ultimate is based on the hairs natural protein Keratin, it will gradually fade out of the hair. Can KeraStraight be applied on pre-treated or coloured hair? YES, KeraStraight KS Ultimate Treatment can be applied to all hair types including highlighted, bleached, coloured and also on hair that has had no history of chemical services (virgin hair). When can I colour my hair if I want to have a KeraStraight? Hair can be coloured either 2 days before the service or alternatively 2 days after. Can KeraStraight be applied on hair that has been permed, chemically straightened or relaxed? YES, our KS Complex Ultimate can be used on any hair that has had previous chemical services. How long does the KS Ultimate Treatment keep the hair straightened, smoothed and repaired? The benefits of the KS Ultimate Treatment last in the hair for a period of up to 4 months depending on the hair type. On hair that has had previous chemical services the results are more dramatic and last longer. With hair types that are natural with no chemical service history, the KS Ultimate Treatments results are better and last longer after subsequent treatments. How long does the service process take? Usually between 2-4 hours, depending on hair type and length. When can I shampoo my hair after the KS Ultimate Treatment? Once the service is complete you can shampoo and treat you hair as normal on the same day. Can I use styling products in my hair after the KS Ultimate Treatment? YES, but your KeraStraight stylist may recommend an alternative styling product to best suit your newly repaired and straightened hair. When am I able to have the KS Ultimate Treatment again after the first application? KeraStraight should last between 2 and 4 months, but can be re-applied after 30 days. What after care is recommended to ensure best possible results are maintained? Kerastraight recommends using only the KeraStraight Moisture Enhance or Volume Enhance Shampoo and Conditioner. These products are Sodium Chloride and Sulphate free and have been developed to maximize the longevity of the KS Ultimate Treatment. They also contain our special KS Ultimate formula to support and maintain your treatment and protect against daily environmental stresses. When you have your Kerastraight Treatment service at Jazz Hairdressing your stylist will give you the KeraStraight Moisture Enhance or Volume Enhance Shampoo and Conditioner RRP £38.00 absolutely FREE. Most of the cost of of having the Kerastraight treatment goes into the fact that it takes approximately 2-4 hours to apply. Prices may vary for very short or very long or thick hair. Please ask for a quotation. However for a normal thickness head of hair with the length around the shoulders the charge will be approximately £190.00. Please bear in mind you will receive the KeraStraight Moisture Enhance or Volume Enhance Shampoo and Conditioner RRP £38.00 absolutely FREE. Where can I find out more about the Kerastraight Treatment service? Call our salon NOW on 01942 671400 and ask to speak with one of our Kerastraight technicians.